Hobbies/Interests: I enjoy sports, especially football, baseball and mixed martial arts. I love the media and how it affects culture: for instance, film, television, and writing. I also enjoy forming new relationships with people, not just people here but in Heaven as well, like Our Lord and the Saints. We always learn something about ourselves when we learn about other people, in this life or the next. What were you doing prior to entering the seminary? I worked for 14 years as a pharmacy technician at a local hospital and a hospice mail order pharmacy. God also Blessed me with College degrees in Communications and Education. What influenced your decision to enter the seminary? I always felt a calling all my life to something different (different from what our culture deems “normal”). I grew up Catholic but never really practiced consistently until a few years ago. I felt I was in a tough point in my life and some experiences in my past needed healing before I could pursue my future. I went to support groups, spoke with a counselor, and I do believe that can help us through the crosses everyone bears in life, but we never are fully healed without forming a relationship with Jesus. I started praying more, going to Church more, and forming relationships with other people who felt the same way I did. I also started volunteering as a Youth Minister at a local parish. I really enjoyed doing that. It was there I really started hearing the call clearly. 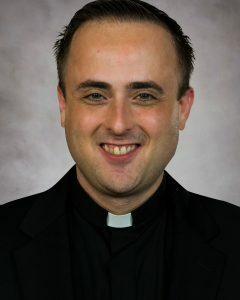 Advice to other young men considering the priesthood: Most priests and seminarians will tell you to pray, go to mass and receive the sacraments….and I completely agree! He is the source and summit of fully discerning. I also encourage you to surround yourself with people who know what you are feeling. Find a priest you feel comfortable with and talk to him. Go to a discernment meeting with other guys. Find close guy friends who love Jesus and His Bride the Church. When you talk with people make sure you feel comfortable around them. Find people who will listen to your feelings, and support you whatever God is calling you to do! Listen to them with your heart and mind. You could be afraid of His calling, your family could be afraid of His calling too, that is going to happen. This is all a part of the discernment process. The support I felt during my discernment (which is still happening) from priests, other men in discernment, and current seminarians are really the fruits of all our prayers of discernment and really helped me, with God’s grace, make the decision.